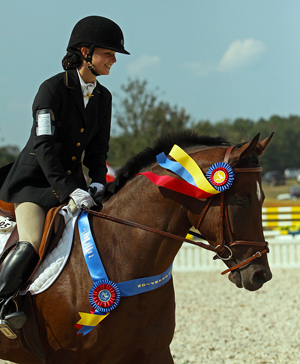 Our Braggin’ Rights page is the ideal venue for you to promote your horse or pony. We want everyone to know about your achievements. Send your news to [email protected]. 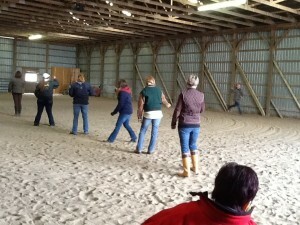 Saturday we hosted a Showmanship/Show Handling and Turnout Clinic here at Reidell Farms. It was a great success and we had a great turn out of interested people. Our Clinician was Mr. Howie Black, a third generation Pony Breeder and Vice President of WPCAO here in Canada. 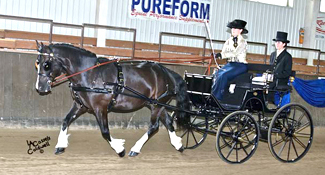 Mr. Black covered a brief history, conformation ideals and proper preparation and presentation in the show ring before we began the showmanship portion of the Clinic. Mr. Black employed an interesting ‘phantom pony’ class in which he asked the participants to imagine handling their ponies. This proved a lot of fun and was very informative about each of our handling styles. When I looked at the pictures that I took it looked like we were learning line dancing. The feedback has been wonderful. We as pony enthusiasts came together and shared an afternoon of fellowship, education and a lot of fun and laughter. The common thread was ‘when can be do this again?’ and ‘when is Howie coming back for more? Reidell Farms would like to say a big thank you to Mr. Howie Black for doing a great job in sharing all his ‘secret tips’ and for his patience answering all our questions. Thank you also to Linda Robinson of Posh Show Ponies who set up her display of pony ware as well as to Donna Lindsay who debuted her new line of custom pony hoodie ware. They all helped make our clinic a great success. Current members of the NorthAmerican Sportpony Registry are generously offered free auditing. A great Thank You! Congratulations to Juliet Hubbard, Wellington, Florida on her purchase of 6 yr. old AWR Rio’s Romulus, upcoming jumper star. 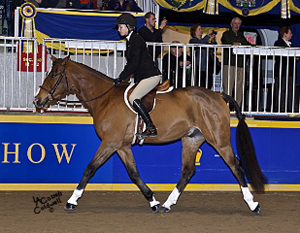 4 yr. old AWR Rio’s Randolf has been sold to Randy Roy & Hunters Glen in King, Ontario for a career in the hunter ring. 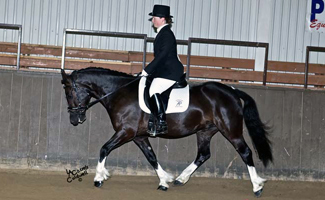 He qualified for both “Cup” classes at the 2010 Royal Winter Fair, placing 8th in the Lieutenant Governors Cup (under saddle) class (photo below). 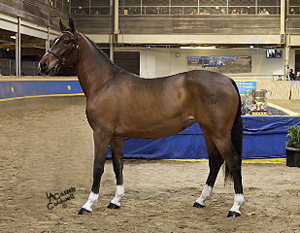 3 yr. old AWR Fleur de Rio made her show debut in 2010, placing Reserve Champion Sr. Filly at the CSHA Breeders Championships (photo below). Last but certainly not least AWR Gwenos Welsh Rose was CSHA 2010 Champion Progeny of Dam. Thanks to Angela Morton, trainer and handler, and Ryan Roy, rider. NASPR-approved stallion Majestic Dakota (owned by Kathy Jefferson of Lower Lake, CA) has earned enough scores in his sporthorse classes to receive a CDS year end plaque. To keep you updated, Mercedes (offspring of Makuba) qualified for the American Eventing Championships at Beginner Novice this year, which was held in Georgia. 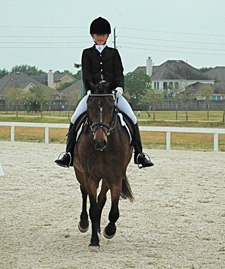 She and her rider, Ashley Guidry, competed against 65 other Junior riders and placed 1st. I just wanted to send in some pictures of USA Railside Roger That! (owned by Darlene Morton) for the Warmblood News. Roger was very well behaved at a Welsh Pony and Sport Pony show held on June 26th and 27th at the Royal Riding Academy in Newmarket. He won all of his driving classes, won the North American Sport Pony Dressage Suitability Under Saddle class, won his 3 and over gelding class and was overall Reserve Champion! We have qualified for the Royal Winter Fairin November and can’t wait to represent such a great registry that will let adults ride and show off their amazing ponies!We took Roger to his first across borders show in July to Michigan to compete in the Metamora Pleasure driving show. Roger is a 4 year old Section C cob and he was only broke to drive in April. Though he is very quiet I wasn’t too sure how he would act at such a large and busy show. I have only driven a handful of times myself, so I entered us in the Novice driver division. The first day was a fun day as it didn’t count towards overall division points. 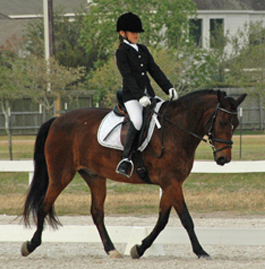 It was a combined dressage test followed directly by a course of 20 cones. I was very happy with our dressage test (we even had a 9 for our back up! 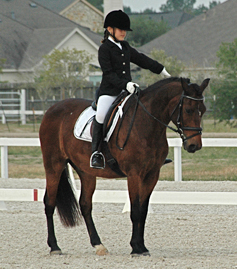 ), being my first and his first driven dressage test ever. I knocked down 3 balls (all my fault of course!) and we were 6th overall out of 12 horses and ponies. The next day we had our Reinsmanship class where I received a 3rd place. 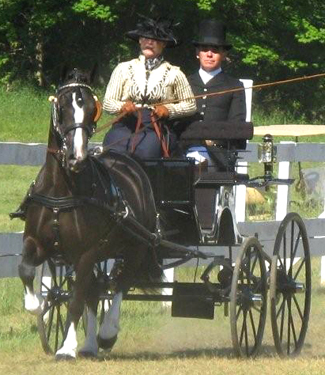 I then had a Ladies to Drive class which 8 horses and ponies entered. We were 3rd and I was very proud of Roger as he took everything in stride! I had a cones class right after a ring class and we were the fastest and we went clean so we won our class! Later that evening I had a Cross Country Pace class and we came in 2nd. The last day I had our Turnout class which we won. We then had another cones class which we on yet again! The last class of the day was our Working class. Roger was very tired after his busy last two days, not to mention the 100F weather! We came 3rd in the working class and we were overall Novice Driver Champion! Needless to say I was very proud of Roger for his first really big show!